Living in a big city like Los Angeles and keeping up with the requirements of life can be a unique challenge. The grind of freeway traffic, a layer of smog in your lungs and on your skin, long lines at the medical marijuana center, it can wear you down. Need some relief? Here is something you can do during the week; it is convenient, accommodates most work schedules, cools you off on a hot summer evening, gives a different perspective of the Los Angeles metropolitan, gets you out in nature, a lot of fun and good times with friends. Let’s head out this evening on the local twilight party boat. 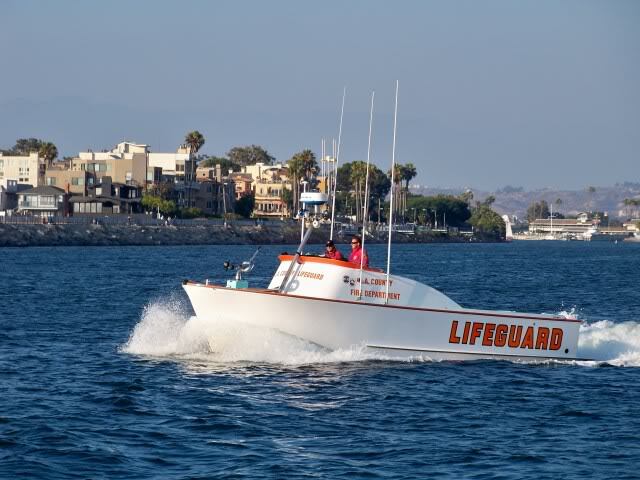 We are going to board the New Del Mar an all aluminum craft, which is part of the Marina Del Rey sport fishing fleet. 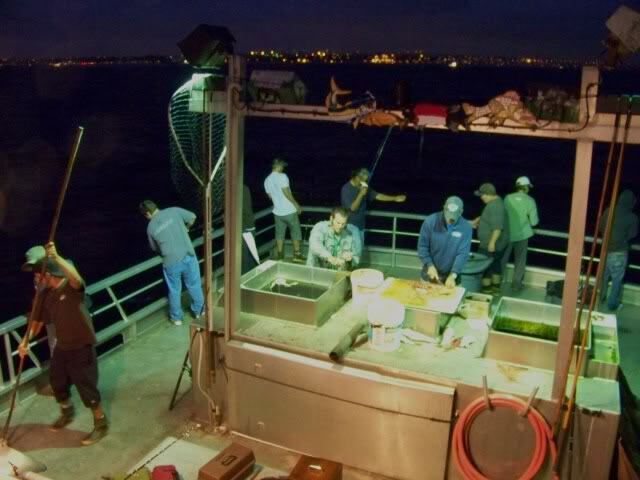 The New Del Mar fishes the Santa Monica Bay for seasonal game fish targeting Sand Bass, Calico Bass, White Sea Bass, Halibut, Barracuda, and Yellowtail. A light manifest for a boat that can take up to 100 passengers. We are heading out to Santa Monica Bay, let’s look around the marina along the way. Marina Del Rey is one of the largest small boat harbors in the United States. With 19 marinas and the capacity for 5,300 boats, the harbor is probably one of the most valuable resources of Los Angeles County. Marina del Rey is located on the west side of Los Angeles adjacent to the Santa Monica Bay. Sitting next to the mouth of Ballona Creek the marina is close to the Los Angeles International Airport with neighboring communities of Venice, my home, to the northwest and Playa del Rey to the south. In this photo you can see the marina and all the way to the Palos Verdes Peninsula at the top of the picture. Anglers on the jetty, keep your eye out for that rogue wave. Seriously, I have been on the rocks and that wave is coming. At least it is coming when I am there and it seems to always get me. This is what it is all about, ‘The Three Amigos’. Representing three nations of birth we are the founding members of the angling club, ‘World Wide Anglers’. 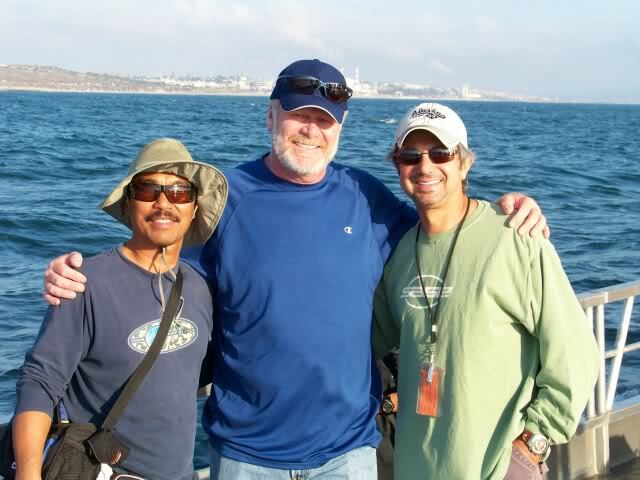 Truly of the world and out to fish the world, from left to right Milo, yours truly, and the Z man, Zad. The WWA is somewhere between a democracy and a totalitarianism, apart from starting the club as President it is a rule that the tallest member is the President and has ‘veto’ power. Another bi-law is that all club meetings must be convened over a pitcher of double dupplebock. Captain Steve at the helm, I have a feeling he is going to put us on fish, almost out of the marina and heading into Santa Monica Bay. Santa Monica Bay, an arm of the Pacific Ocean, is located along the coast of southern California. Its boundaries are considered to be the Pacific Ocean east of an imaginary line drawn from Point Dume in Malibu to the Palos Verdes Peninsula. Santa Monica Bay is also the home of crude oil importing. We are close to the oil refineries of the South Bay. A few words about the Deck Hands/Crew, the crew will go out of their way to help you. Do not know the knots and the rigs, no worries they will tie for you and rig you up. Their goal is to help you catch fish. Like any good fishing charter they want you to catch fish, have fun, and come back for more on another day. That is very cool and just like the BBZ they will help you learn. These guys work long days, share their knowledge, and are there to make your time on the water the best it can be, so make sure you show your appreciation at the tip jar. Tips play a big role in their income. Hooked up on the portside, keep those rod tips up! Hey this set up looks just like a freshwater largemouth bass swim bait rig, who do you think this gear might belong to? 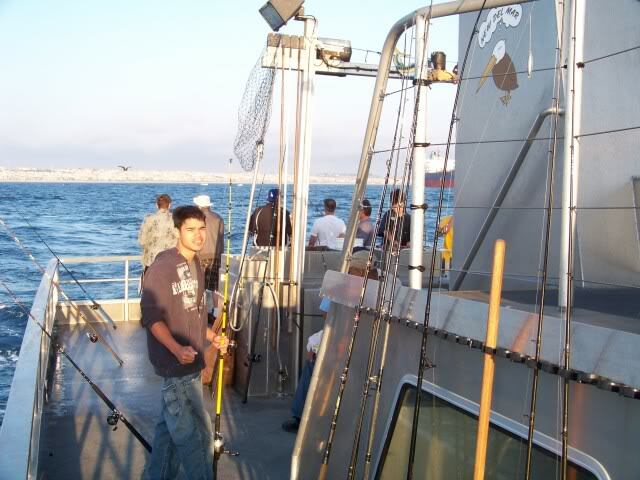 I do not want to say that I was the best angler on the boat but my catch ratio and quality was extremely high. 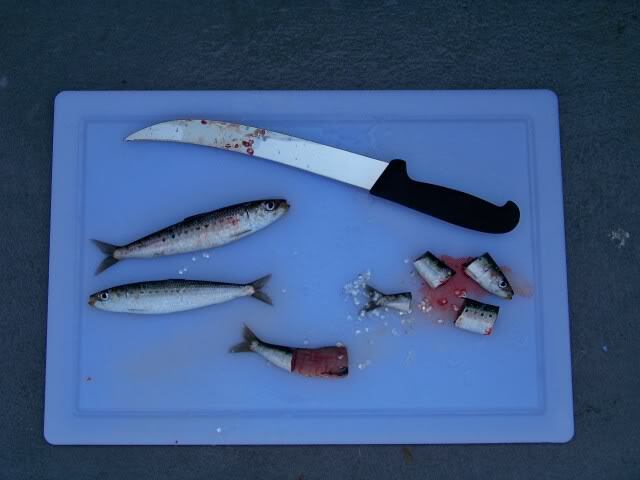 Lessons learned ‘listen to the fish’. Here is what the bass had to say and what made the difference. The sea lions were all around us and I immediately recognized that the bass were not going to come up in the water column. The bite was very soft and just like a pressure bite at the lake it was not that easy to detect. I felt that a lot of guys were probably getting bites and did not know it. The chunk bait was out performing the guys fishing whole live sardines; most will nose hook a sardine so it will swim, not what the bass wanted tonight, another reference to the sea lions and the water column. The chunk bait also matched the chum. The dropper loop was avoiding the bottom feeding bat rays. I detected that the captain had us anchored right on the structure and the bass were right under the boat, no need to cast out just drop it straight down, that is where my best bites came from. Also a drop shot cast out at an angle holds the bait closer to the bottom than the same rig that is dropped straight down. With a very vertical presentation held up of the bottom straight down and under the boat, chunk bait on a ‘drop shot’ presentation, your line coming over your thumb to help with detecting the soft bite and your odds of success were going to climb. My bait preference or should I say the bass’s preference this night can be seen further down at the bottom of the photo captioned ‘bait options’. For a fresh water bass angler this is a unique situation, everyone is in the same boat and in plain sight. Look for the clues, watch who is doing well and see if you can detect why. The answers will be around you. 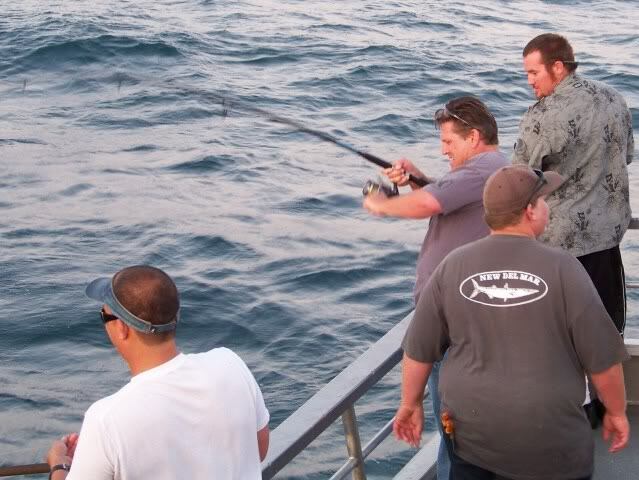 You never know what you might hook into; notice the deck hand standing on the bat ray’s stinger equipped tail. 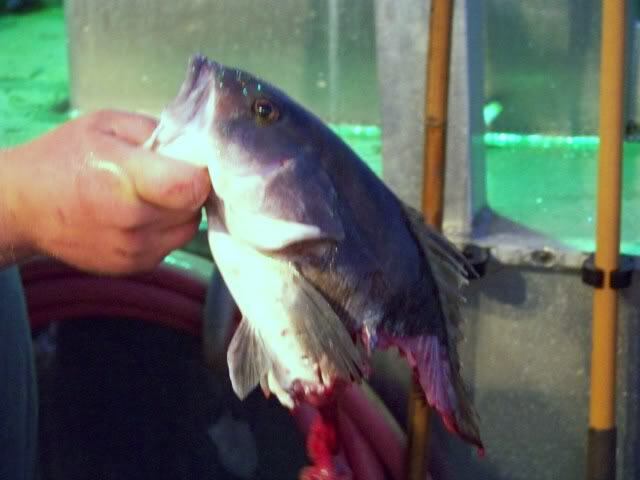 This ray was hooked on the starboard side and landed on the port side, tough fight. There are several effective techniques that will entice ‘Sandys’, most of which bare a similar appearance to freshwater bass tactics. This evening, with mixed results, anglers used a variety of techniques. The fish tell us that one method stands out from the rest, and it is the dropper loop rig with fresh bait. The dropper loop rig is cousin to the fresh water drop shot rig. Just remember that no matter where you fish, the hot bite today may and probably will change tomorrow. Are we having fun? That moonlight is bright, isn’t it Milo? That rod is up, what about your pants? There is something extremely nice about being out on a boat with your friends and other anglers that you have never met and yet no matter who it is that is hooked up you look over and see the bend in their rod and you and others shout words of encouragement. Hey this has been a lot of fun. Thank you to Captain Steve and the crew of the New Del Mar. If you are around, the next time we go out come and join us.